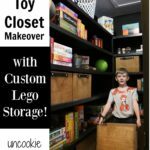 I was sick of the Lego Storage we were using, so I came up with a new system I’m hoping works. 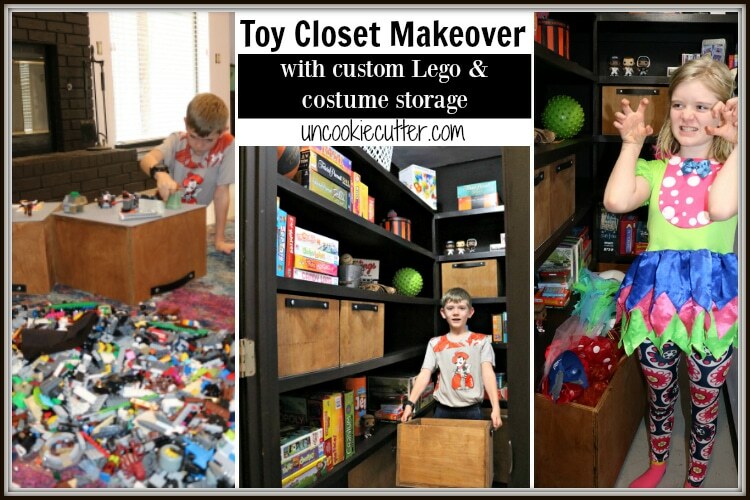 Get the details on our whole toy closet makeover with custom built Lego and costume boxes. Hello! If you’ve been following along for a while, you know that I am in the middle of our den renovation. Part of the problem was lego storage. Isn’t that always the way? We are fortunate to have a huge toy closet, however the Lego’s were still out and about, taking up space and the cheap plastic bins we were using just weren’t working. So, I gave up on trying to keep them organized, I just wanted them put up. It would be nice if my kids would organize them by color or shape, but that isn’t going to happen. So, I thought just big boxes would be good. However, I wanted them to be solid, fit perfectly on the shelf and be able to be used for both building and storage. Like little mini tables they could put away when they were done with them. This post is sponsored by Wagner. All ideas and opinions are my own. This post also contains affiliate links. See my full disclosure policy here. I actually had some 3/4 inch plywood that I bought for another project but ended up not doing, so I wanted to use those pieces so I didn’t have to buy more. Plus, I knew I could get a sleek, modern look and they would be sturdy. I wanted the front of the box to be seamless and I wanted a Lego base plate to fit on the bottom of the box. 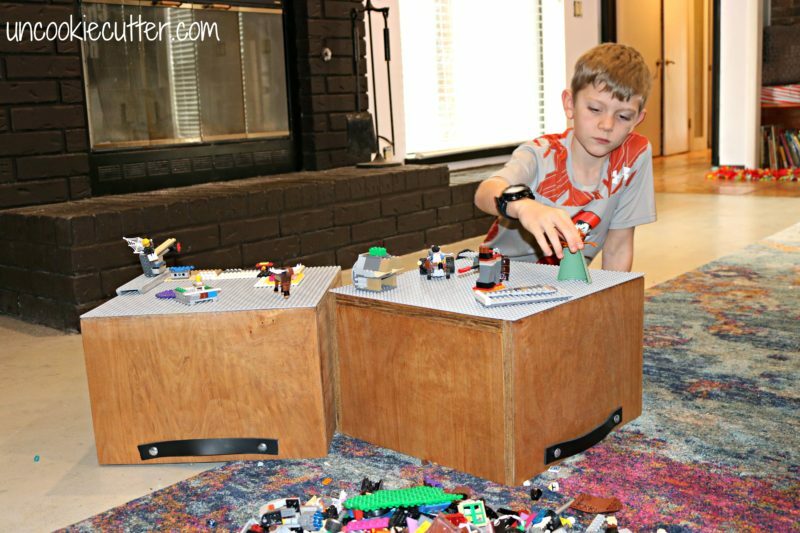 That way they could turn the Lego storage into mini Lego tables. I started by breaking down my plywood. Plywood can be tough to break down. 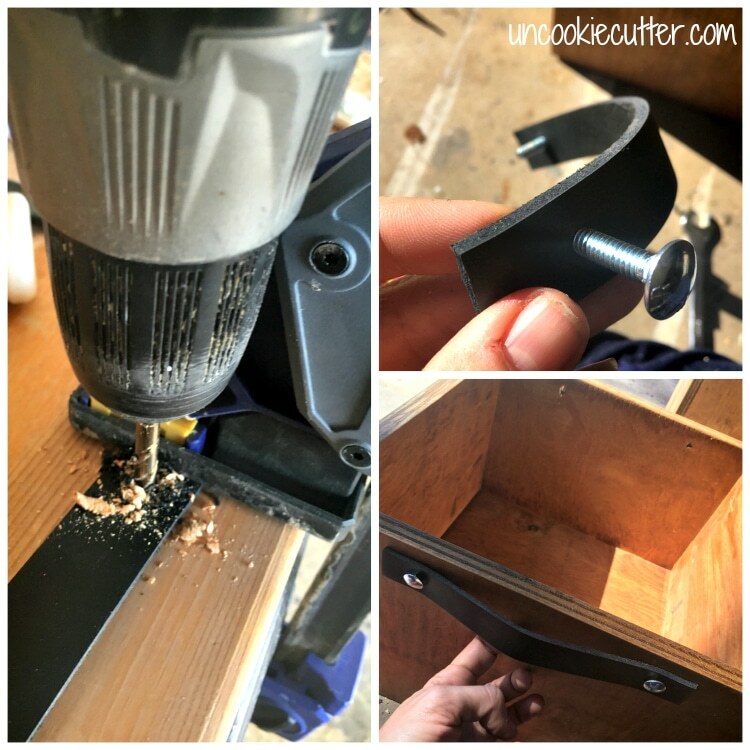 I find it’s much easier to use a fence, like my Rip Cut or Accu Cut. I always make it a little bigger than I want and then level it out on the table saw. 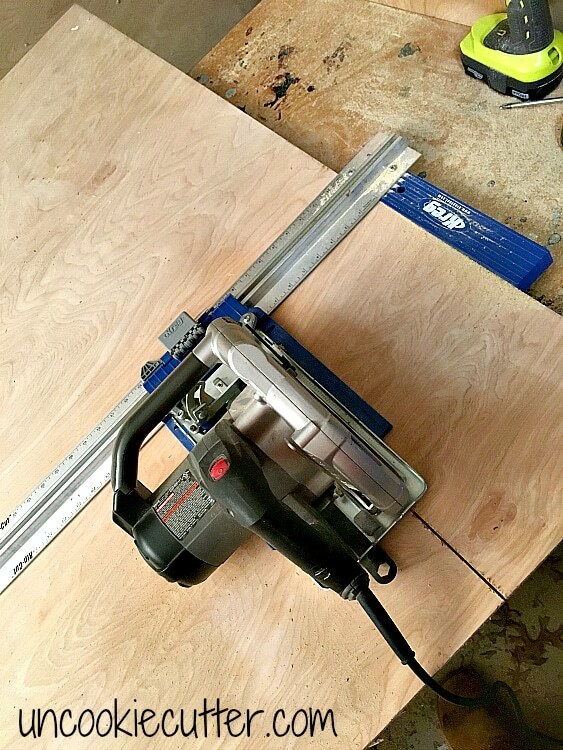 When you have your smaller pieces and move to the table saw, set your fence once for each measurement and run all the pieces at that measurement through. 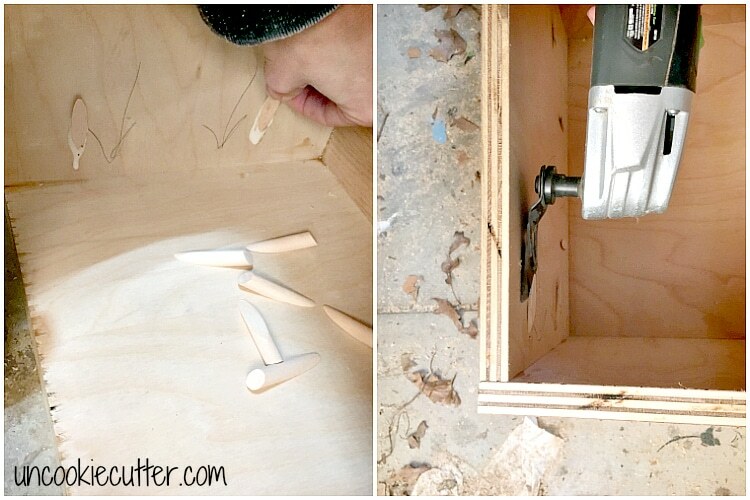 This will insure your pieces are all the same size, which is important for a box like this. Since I wanted the bottom to be 15″ x 15″ to fit the Lego baseplate, the fronts to be seamless, and the boxes to be 10″ high to fit perfectly on the self, here are the measurements I used. Adjust to fit your space, but keep in mind that baseplates come in 15″ x 15″ and 10″ x 10″. 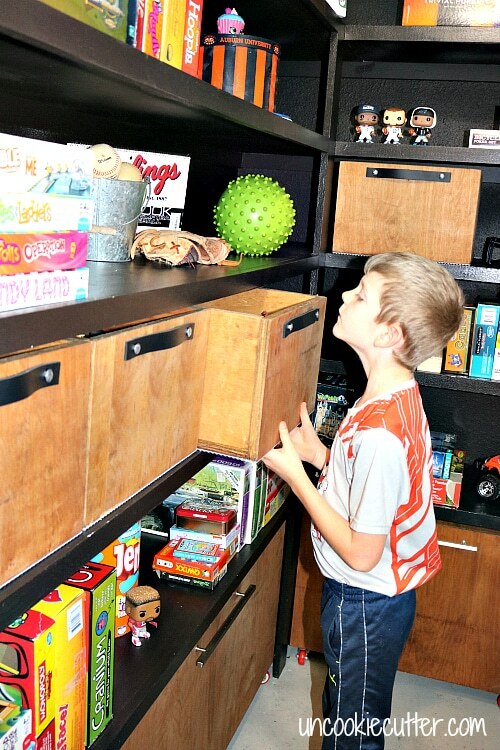 *Just a note, these are pretty heavy once the Lego’s are in them, so you could adjust the sizes down a bit if your kiddos are a bit younger. You could use the 10″ x 10″ base plate and 1/2″ plywood and still be fine. Then I drilled some pocket holes like below and attached all the pieces together. A corner clamp is very helpful to get them all lined up just right. Note that I put the pocket holes on the bottom piece on the bottom of the box so they wouldn’t show. 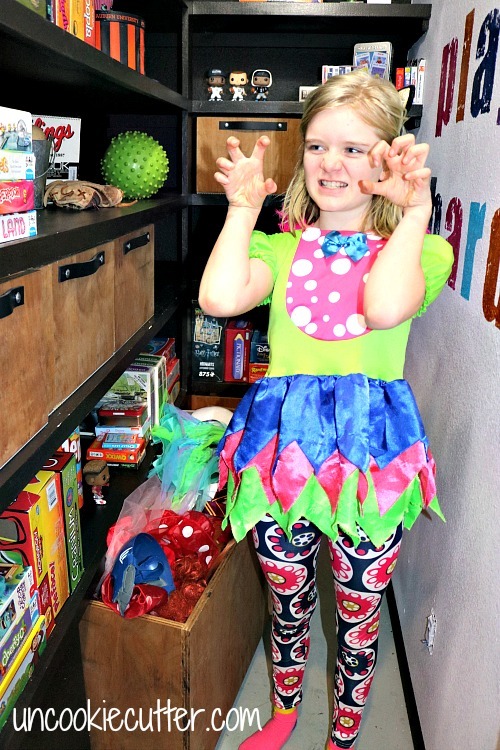 All the boxes aren’t for Lego storage, I also made a couple of rolling boxes for below the shelves to hold all the costumes my kids still love – even at 10 and 8! Those are a lot bigger and have wheels on the bottom. After the boxes were assembled I drilled holes for the handles (You could use whatever handle you like, but I’ll elaborate more on the leather strap handles I made below), filled the pocket holes and sanded everything down. To fill the pocket holes, I got some Kreg pocket hole plugs, glued them in and after they dried, shaved the excess off with my handheld rotary tool. Now it’s my favorite – time to stain. If you saw how I used my Flexio 3000 to take down my popcorn ceilings, you know I love this thing! It’s so easy to use and clean and it makes painting and staining super quick and easy. I laid out some plastic, and used nearby rocks to hold it down. 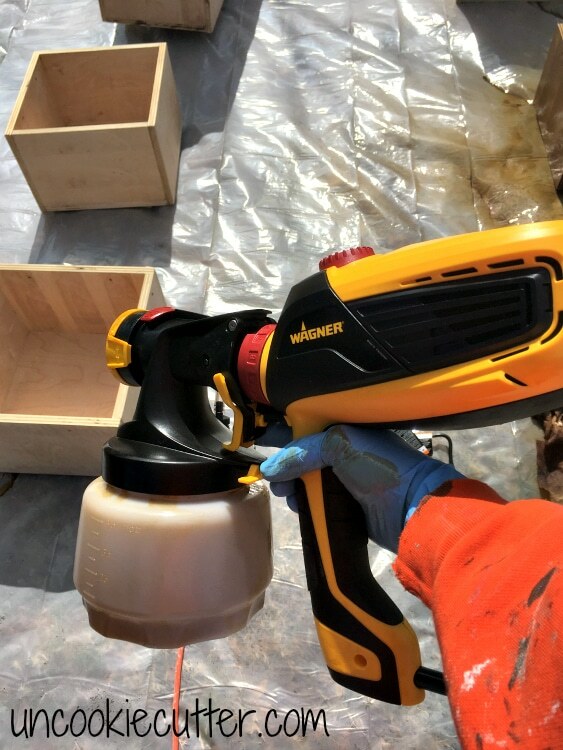 Then I brought my boxes out and filled my sprayer up with Minwax Golden Oak. 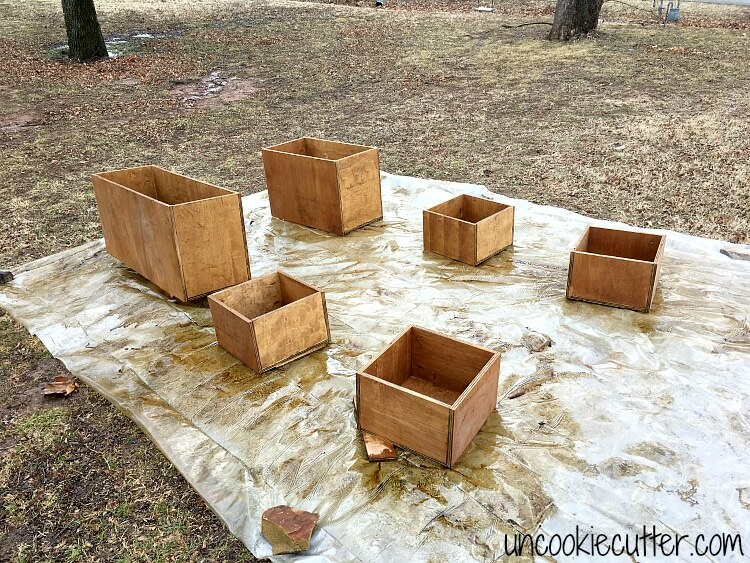 I sprayed a couple of boxes and then wiped them down with a paper towel. So easy! I have never sprayed stain before, and it went on like a dream. 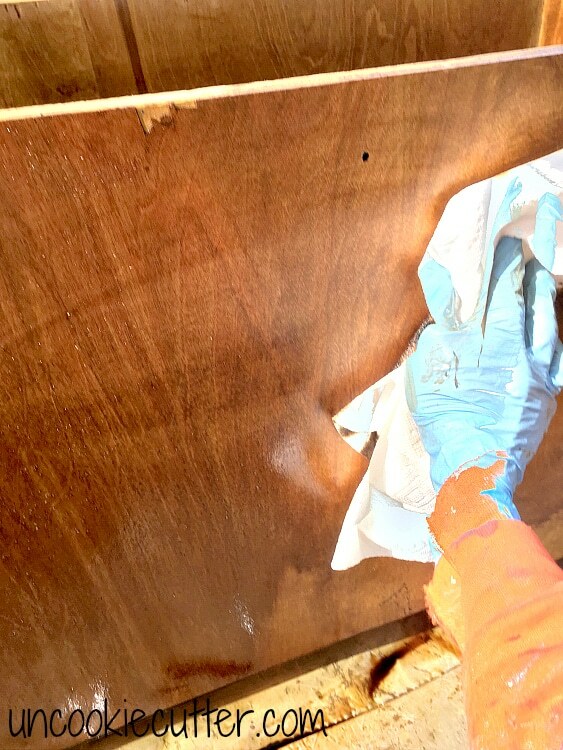 I didn’t realize you could use sprayer with stain, but you totally can. You can adjust the Flexio 3000 to allow as little or as much flow as you like. I set the sprayer at about medium for spray with the larger surface cover. To set the boxes out, get sprayer ready, spray, wipe and then clean the sprayer took about 35 min. Seriously! So fast and easy! Once the stain was dry, I attached the handles and the wheels on the larger boxes. For the smaller boxes, I bought this leather strap, cut it in to pieces and drilled holes an inch in from each end. I then attached each strap with 1 1/4″ carriage bolts and anchor nuts, leaving a little gap for the hands. The very last step was to glue the base plates on. 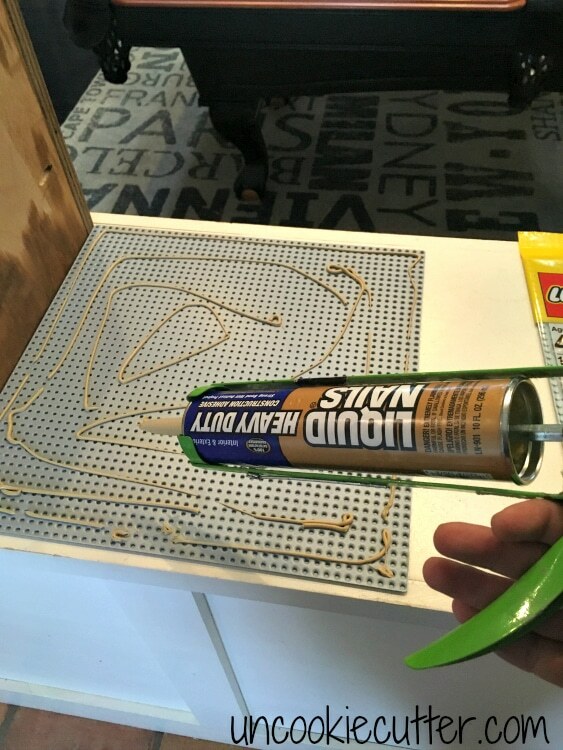 I used liquid nails, but read the directions afterwards and they say not to use it on plastic. Whoops! They seem to be stuck on there pretty well, but you might try and see if there is something else that would work better. That’s it! It may seem like a lot but it was actually a pretty easy little build. My son immediately started playing with them. When he was done, the Lego’s go right back in the box and they are put away. And they aren’t just good for Lego storage – let’s not forget about those rolling bins underneath – they hold tons of costumes! Like this one, that is way too crazy small but the girl won’t let me get rid off ;). 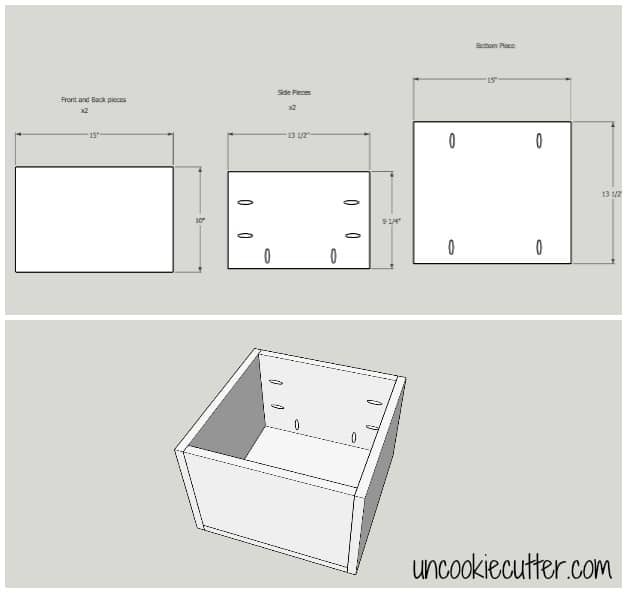 For these I just used regular drawer handles and attached casters to the bottom corners. Easy peasy! As for the rest of the room, the walls are Dutch White by Behr Marquee and the Shelves are Off Broadway in Behr Marquee. You can read the post about the wall art here. Stay tuned for more of the den makeover. Up next, the craft station! Great idea!! Legos are always hard to store. Looks like this system is a win! Hello April, great share. The way you are trying to store these legos simply brilliant.your approach is space saving. ooh woow really so lovely idea. And thanks for sahring.